It's been said before but I'll repeat it / Don't you feel like you've been cheated? There is one thing I will never do...Trust you. -NoMeansNo, "Small Parts Isolated and Destroyed"
And what unarguable facts did they uncover? Let's parse that paragraph line by line. Who considered the individual market a mess? The roughly 15 million people that voluntarily made up that market? By what objective standard is it a fact that insurance companies turning down people with pre-existing conditions a bad thing? It's actually a very good thing for the people without said pre-existing conditions. The final, and most offensive of the newspeak is this: "...none of the insurance was standardized..."
GASP! PEARLS GRASPED! People had to choose between different insurance plans! THE HORROR! What if they made the wrong choice? How can people make decisions about what product best fulfills their needs without PolitiFact or Obama telling them what's best for them?! The point that insurance policies weren't standardized goes to the heart of the ObamaCare debate. The fact that people have less choice now about what coverage they must pay for is precisely the reason insurance companies find themselves canceling hundreds of thousands of policies. It's why parents are now forced to pay for mental health and drug counseling coverage for their toddlers. It's why menopausal women are forced to have birth control coverage. But don't let that bother you. PolitiFact tells us it's a fact that standardization is a good thing. This "standardization" point makes even less sense when you realize offering people "more choices" has been one of Obama's biggest selling points for the ACA (a claim PolitiFact has yet to rate). Experts told us there is no precise data to determine how many people will be forced to change health care plans, but they generally agreed the number will be small this year. 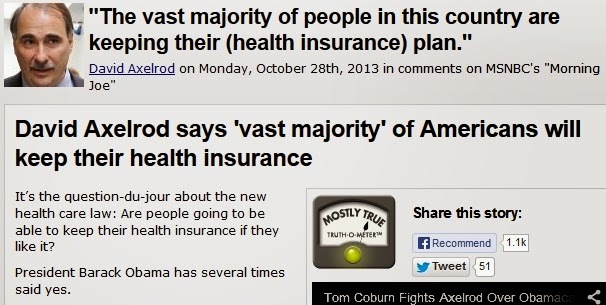 This offal served up by PolitiFact is about as shameless a shilling for Obama's signature law as can be. 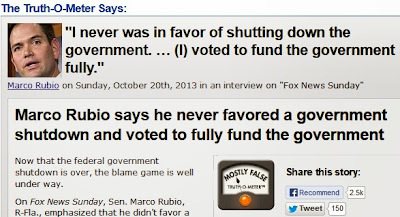 Rather than clarify the truth, PolitiFact only clouds the issue with diversions and partisan commentary. Editor Aaron Sharockman is either hopelessly incompetent or is enveloped in a painful lack of self-awareness. One wonders what kind of denial is going on in the offices of PolitiFact to miss such obviously biased writing and letting it see print. PolitiFact is an embarrassment to journalism. It's pretty obvious in context that Axelrod's sparring partner, Tom Coburn (R-Okla.), was referring to policies changing, not to loss of insurance. Axelrod switched tracks on Coburn to talk about cancellations. That's a patented technique of misdirection, and PolitiFact either didn't notice or didn't care. [T]he sad reality is that David Axelrod himself also is dead wrong: it’s more accurate to say that the president’s pledge will be shattered for a solid majority of Americans with private health insurance coverage. More precisely, of the 189 million Americans with private health insurance coverage, I estimate that if Obamacare is fully implemented, at least 129 million (68%) will not be able to keep their previous health care plan either because they already have or will lose that coverage by the end of 2014. Axelrod moves goalposts. 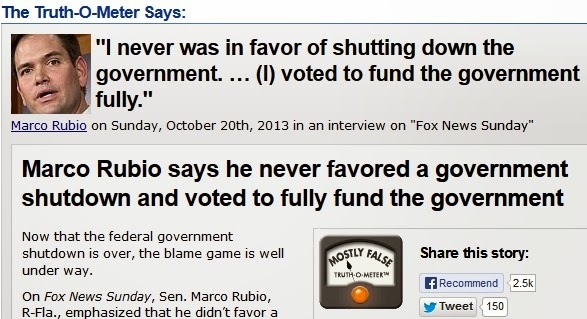 PolitiFact smiles and nods. Not at all to our surprise, PolitiFact's announcement of its "PolitiPundit" project, dedicated to fact checking media figures and pundits the PolitiFact way, reiterates PolitiFact's intent to keep right on publishing "report cards" for the people and organizations it fact checks. It's the same old mixed message from PolitiFact: No, it doesn't use basic scientific methods in choosing its stories. Yes, readers should treat PolitiFact's "report cards" as though PolitiFact uses scientific methods. PolitiFact says "bipartisan" doesn't mean just one or two votes from one partisan group. What does the dictionary say? representing, characterized by, or including members from two parties or factions: Government leaders hope to achieve a bipartisan foreign policy. Cruz is correct using the loosest definition of "bipartisan." Why would PolitiFact fail to recognize that in its rating? The rating arbitrarily discounts a clear element of truth in Cruz's statement. In contrast, when President Obama claims Democrats and Republicans voted to keep the government open, PolitiFact finds that no Republicans supported the final bill that would have prevented a partial government shutdown. Is Cruz objectively misleading his audience more than Obama misleads his? Look in vain for the evidence in the fact checks of Cruz and Obama.